US Sec. of State Pompeo says PM Netanyahu's promise to apply sovereignty won't harm 'deal of the century,' 'reframes and reshapes' problem. 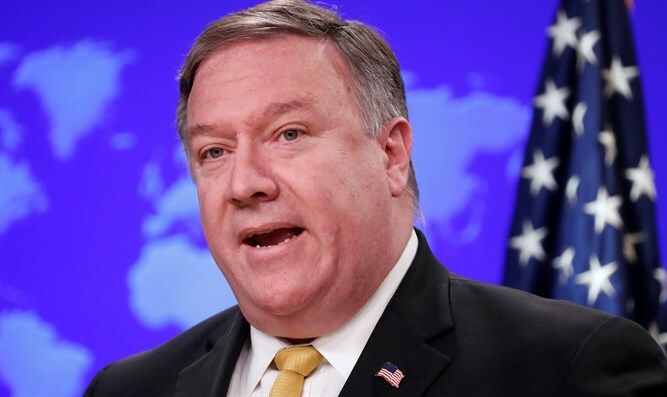 US Secretary of State Mike Pompeo on Friday told CNN that he does not believe Israeli Prime Minister Binyamin Netanyahu's promise to apply Israeli sovereignty Judea and Samaria will harm the US President Donald Trump's "deal of the century." Speaking to CNN's Jake Tapper, Pompeo said, "I don’t. I think that the vision we’ll lay out is going to represent a significant change from the model that’s been used." "We’ve had a lot of ideas for 40 years. They did not deliver peace between the Israelis and the Palestinians. Our idea is to put forward a vision that has ideas that are new, that are different, that are unique, that tries to reframe and reshape what’s been an intractable problem, that multiple administrations have grappled with, multiple administrations in Israel as well. "We hope that we can get to a better place, everyone wants this conflict resolved. We want a better life for the Israelis without this conflict and we certainly want a better life for the Palestinian people." Earlier this week, Pompeo refused to back a two-state solution, emphasizing that "ultimately the Israelis and Palestinians will decide how to resolve" the conflict. The peace plan is expected to be presented on May 15.